This is an update to the previous blog: Toronto CNE Food Borne Illnesses: TPH Samples of Cronut Burger Contaminated by Staphylococcus Aureus. As of 8 a.m. today, Toronto Public Health (TPH) has received 223 reports from CNE visitors who experienced gastrointestinal symptoms after consuming food at the CNE from August 16 to August 20. 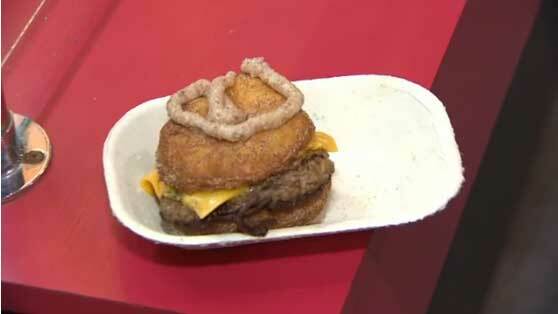 The only common food consumed by those who were ill is the cronut burger sold by Epic Burger and Waffles. Here are the most recent results of TPH’s ongoing investigation on an outbreak of food-borne illnesses at the Canadian National Exhibition (CNE) in Toronto, Ontario, Canada. Additional lab results have now confirmed that the maple bacon jam topping on the burger contained Staphylococcus aureus toxin and is the source of illnesses reported to TPH. TPH’s investigation is focusing on the supplier of the bacon jam, Le Dolci, to determine how the contamination occurred. Le Dolci has voluntarily ceased production of this product. TPH will ensure that there will be no distribution of food products including the bacon jam from that establishment pending further investigation. Please click here to see the TPH fact sheet about staphylococcus aureus food poisoning (pdf). TPH’s investigation included a thorough on-site inspection of Epic Burger and Waffles on August 21, including collection of food samples for testing and interviews of people who were ill to determine their symptoms and what they ate. TPH’s investigation is focusing on the supplier of the bacon jam, Le Dolci, to determine how the contamination occurred. Le Dolci has voluntarily ceased production of this product. TPH will ensure that there will be no distribution of food products including the bacon jam from that establishment pending further investigation.